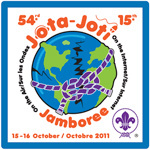 Amongst the digital modes run from Gilwell Park for Jamboree on the Air will be slowscan television. This is a mode that involves sending still photos to other stations using the HF and VHF raido bands. The picture is converted into a series of tones by the computer, which are then sent to the other station. These are then decoded back into a apicture at the other end. There are 2 formats of sstv - analogue and digital. Analogue sstv does not have any form of error correction and images are therefore subject to noise and fading. This is the most popular format of the mode. Digital sstv incorporates an error correcting mode and therefore the pictures come out perfectly at the other end. Stations will request a resend of sections of the data that don't come through correctly until the picture is received. Ham Radio Deluxe http://www.ham-radio-deluxe.com/; MMSSTV http://hamsoft.ca/pages/mmsstv.php; and MixW http://mixw.net/ are amongst the most popular. For digital sstv there is really only one application at the moment - Easypal http://vk4aes.com/ . All of these applications take the audio from the radio and feed it to the soundcard on the computer. For receiving sstv, this is all you need! For transmitting, you need an interface to control the ptt and ideally isolate the audio in and out from the computer. On some radios, like the modern Yaesu radios, there is a serial port built into the radio that connects to the computer for full radio remote control. This makes setting up digital transmissions easy. Once you have a software installed, listen to some of the popular sstv frequencies to get an idea of what's happening. Let's concentrate on analogue sstv for now. The main frequencies are: 14.230 Mhz and 3.730 Mhz. For each of these bands, there are channels either side of the main frequencies for use when the mode is busy. As you start listening to these signals you'll hopefully see a sync pulse and the signal data show up in the waterfall of your program. Align this sync pulse at 1200hz to receive the picture. There are various modes on analogue sstv: Martin1, Martin2, Scottie1, Scottie2 & ScottieDX . There are others, but these are the main ones used. For VHF there are also P3, P5 and P7 - these take 3, 5 and 7 minutes to send the picture, but with the longer transmission times the picture quality has to be seen to be believed! You'll need some images to send... These can be anything (within reason...) but usually they show the operator, his shack and radios, maybe his location locally.. anything of interest to both parties really... a note of caution at this point: If you are showing sstv to Scouts, some stations might not send the kind of image you would wish to receive - always keep an eye on what's coming in, and if it looks distasteful, clear the screen. With analogue, once the signal has gone, it's gone - there's no buffer to display the missed signal again! Fortunately these kind of images are few and far between. One source of images to send is to connect a webcam and send a 'live' grab of the Scouts in the shack - this is nice and spontaneous and many of the programs have the facility to grab the image and transmit it straight away. Most the progams also have templates, which allow you to set up text for the most used elements - callsigns of both stations, signal reports, name, location, 73's etc... With these templates, you can change the image in the background whilst keeping the text over the top. Before you start sending pictures, become familiar with the format that a contact takes and prepare your outgoing images in advance. Sstv contacts can be frenetic during the exchange of images, and you don't want to be struggling to find an image mid contact. Images from the GB2GP - Gilwell Park - sstv station will be posted here during JOTA.